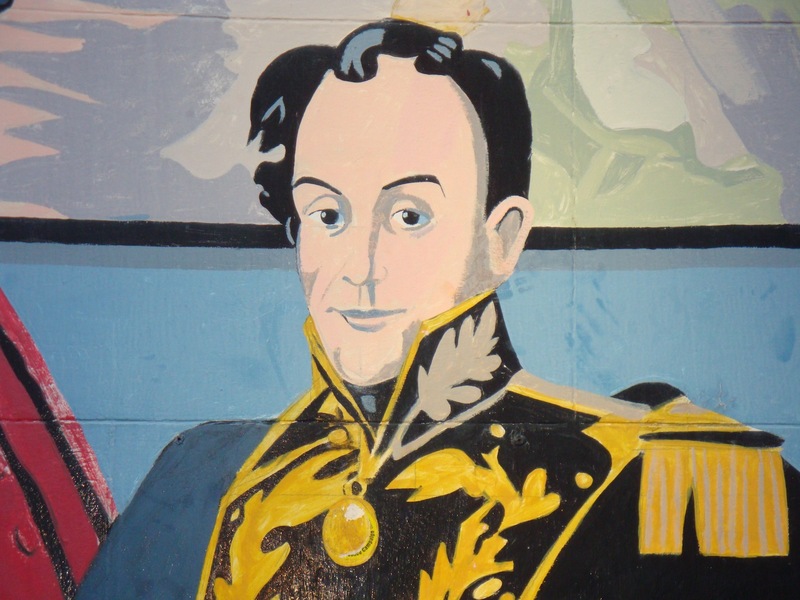 Simon Bolivar: as featured on the Fitzrovia Play Association Mural (2000) painted by mural artist Brian Barnes MBE. In 1810 Simon Bolivar arrived in London as a delegate from the newly established junta of Caracas. Their base was the house of Francisco de Miranda at 58 Grafton Way. Aware of British naval power, the revolutionary government wished to assure the dominant regional powers that they would not upset the ‘status quo’. By the time the delegation arrived, de Miranda was a leading publicist for the cause of South American independence, running a newsletter, El Colombiano, modelled on the pioneering efforts of Blanco White and Hippolyto Jose da Costa with their El Espanol and Correio Brasiliense. Bolivar landed at Portsmouth on 10 July 1810. The senior member of the mission was Luis Lopez Mendez. They went directly to London where a series of meetings were arranged with Government Ministers, and Foreign Office officials. Bolivar and his companions were seeking to urge the British not to intervene in the Caracas Revolution. With the collapse of the Spanish monarchy, the occupants of Caracas had taken the opportunity to throw off Madrid rule and declare autonomy. The British statesmen they met had several concerns. Above all they wished to pursue the conflict with Napoleon in Spain. But the Spanish were hopelessly dependent on British supplies and money. They promised to recompense the British when they regained access to their gold and silver shipments from South America. The British had other concerns. Their West India merchants, had an opportunistic eye on the Spanish trade to the South of the continent. A third factor bothered them. In 1791 the slaves of St Domingo had rebelled against their French masters. In 1806 Dessalines declared Haiti an independent republic. The British in the sugar islands of the West Indies were terrified of suffering a similar ‘fate’. The day after landing Bolivar and Mendez sent a letter to the Foreign Secretary stating that: “Venezuela, as an integral part of the Spanish Empire, is menaced by France and desires to have in support of its security, the maritime protection of England” and requesting “the means which may be necessary for defending the rights of its legitimate Sovereign…against the common enemy”. And they asked for ‘the Mediation of His Majesty’ in order to preserve their peace and friendship with their brethren of both Hemispheres. Bolivar and his companions travelled to London and took up residence in Duke Street, Marylebone. But much of their time was spent with de Miranda at his house in Grafton Way. From here introductions, mostly with prominent Whigs, were arranged throughout London. The British thought about their requests, but they had already been considering the possibilities. Notes appended to the document revealed the Foreign Office feared that the insurrection would spread thoughout the Americas. Trade was paramount in the minds of the British. Four years earlier the Governor of Grenada had informed William Wyndham that the inhabitants of Caracas were thoroughly sick of Spanish rule. Should they succeed in overthrowing it, he said, it “would extend our commerce in a wonderful manner – The Caracans offer a very rich trade.” The vultures were already hovering over the carcass of the Spanish ‘Empire’. Spanish treasure was vital in the European conflict. Whilst Napoleon had defeated the ‘Third Coalition’ at Austerlitz, his manoeuvres had exhausted his finances. One key figure in this contest was Bolivar’s host, Miranda. Formerly a French republican general, he had defected to London and was in receipt of a British pension. In 1797 he had conspired with Henry Dundas to ‘liberate’ Venezuela and Colombia. Secret funds were also offered in 1804 for much the same purpose. In 1806 he tried to launch an invasion, again with British help. The fate of Venezuela, and their neighbours was now, nominally, in their own hands. This article was originally published 4 December 2012 in the printed edition of Fitzrovia News.